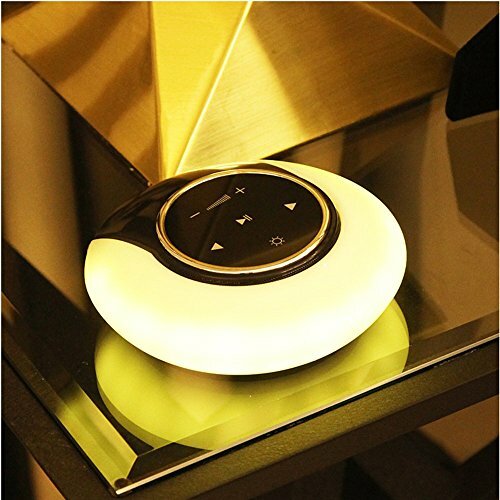 Misbo 14 LED Light Wireless Bluetooth Speakers，This product is fashion,gorgeous,compact, portable, and pure in sound ,multi-functional integrated design,the use of advanced technology in the industry electro-acoustic technology, so that you use at home, outdoor travel, business work anytime, anywhere to enjoy the excellent sound effects for Your tablet, mobile phone, digital music player and other audio-visual products provide value perfect sound quality. This machine is a new generation of digital audio equipment. Called the master of the works, sincerely hope that it can bring you the extraordinary enjoyment of the digital age. Function Description:Music play: Can connect mobile phone or other device which with bluetooth function ,search the bluetooth device named"DEAMAK-I" to connect, during connecting, the bluetooth indication flash,when connected successfully,it flash slow,and with a reminding sound.Then can play the music through the audio. With LED light :touch the light control switch,can turn on or off the light ,build atmosphere,press the switch longtime,dimming full range. Audio input:insert a active audio wire, then can play the music. If you have any questions about this product by TBAO, contact us by completing and submitting the form below. If you are looking for a specif part number, please include it with your message.